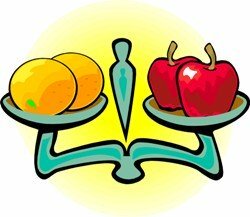 What is the difference between gerunds and infinitives? When should you use each? Let's start from the beginning. A gerund is a noun made from a verb. To make a gerund, you add "-ing" to the verb. In the sentence "I swim every day", the word "swim" is a verb. In the sentence "I like swimming", the word "swimming" is a noun. Therefore, "swimming" is a gerund. In the sentence "She reads several books a week", the word "read" is a verb. In the sentence "Reading is important", the word "reading" is a noun. Therefore, "reading" is a gerund. More examples of gerunds: buying, fishing, running, watching, telling, and so forth. The word "gerund" actually comes from the Latin word gerere, which means "do". You could say this actually makes sense: the gerund describes an action, something you do. Gerunds are often used when actions are real or completed. An infinitive is the basic form of the verb + "to". Examples: to buy, to fish, to run, to watch, to tell, and so forth. The word "infinitive" comes form the Latin word infinitus, from in- (not) and finitus (finished, limited). You could say this actually makes sense: the infinitive describes an action, but unlike a regular verb, it is not limited in any way. The regular verb is limited to the tense and subject. For example, in the sentence "Diana danced" the action is limited to Diana and to the past. However, the infinitive is unlimited. In the sentence "To dance is easy", the action is not limited to any subject or to any time. Infinitives are often used when actions are unreal, general, or future. If you want to speak correct and natural English, you should know when to use gerunds, and when to use infinitives. Click the following link for the list of verbs followed only by gerunds. Click the following link for the list of verbs followed only by infinitives. 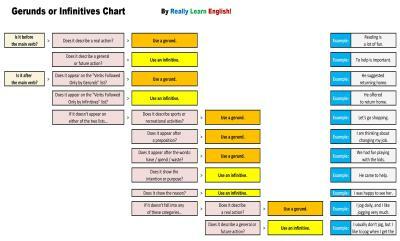 To make a long story short, you can use the "Gerunds or Infinitives Chart" to help you decide which form to use. Click on the small picture to see the full sized version. to real activities or experiences. talking about potential or possible activities or experiences. So let's say you eat ice cream every day. This is an actual action you are doing. Then you could say: "I like eating ice cream". On the other hand, if you are on a diet, and you don't usually eat ice cream, then you are talking about a potential action. You could say: "I like to eat ice cream." When used before the main verb, gerunds tend to sound more like natural English. For example, the sentence "Playing tennis is a lot of fun" sounds more natural than "To play tennis is a lot of fun". The latter sentence sounds more theoretical. After the main verb, both gerunds and infinitives can be used. The main verb in the sentence determines whether you use a gerund or an infinitive. Some verbs take only a gerund. Some verbs take only an infinitive. Some verbs can take both gerunds and infinitives, with only a slight difference in the meaning (as explained in Part I above). A few verbs take both gerunds and infinitives, but with a significant difference in the meaning. So when you need to decide which one to use, first check whether the main verb is limited only to gerunds, or only to infinitives. The word "go" + sports or recreational activities usually take a gerund. Examples: "Let's go shopping", "They went skiing". After a preposition you should use a gerund. Examples: "I will talk with you before going to lunch", "I am looking forward to working with you". Expressions with the words "have", "spend" and "waste" take a gerund. Examples: "She had fun skiing", "He wasted all his time worrying". In many cases, the infinitive form is used to show the intention or purpose. Examples: "We are here to help", "He left to catch the train". The infinitive form is also used to show the reason. Examples: "We were sad to hear about your difficulties", "She was shocked to learn the truth". If none of these guidelines apply, simply use the principle in Part I above. Does it describe a concrete action? Then use a gerund.  Does it describe a general or potential action? Then use an infinitive. "I love to paint. I wish I would paint more often." Anyhow, whenever you are in doubt, you can always use a dictionary to help you out! Oxford Advanced Learner's Dictionary is a really good one to use. It shows you whether the verb requires a gerund, and infinitive, or can take both. Just look at the data below the definition. Note: For an advanced tutorial on the subject visit the English Page tutorial on gerunds and infinitives.